A celebrity spokesperson is the ultimate stamp of approval, and it can be invaluable. Or can it? The combination of a celebrity and a brand offers endorsement, trust, name recognition and increased stock prices. In agriculture, we may have familiar personalities that represent the industry as a whole, those who are known for their contributions to ag and ranching either through their personal or professional lives. But for every recognizable name and face used as a calling card, there are limitations to this manner of publicity. How does a brand navigate the value of using a well-known personality to represent its products, services and industry? And how does it recover when things might go awry? In the consumer’s mind, a celebrity as spokesperson gives value to a product or service. Likewise, it’s generally believed that the more high-profile the individual, the more value is attributed to the product or service. And finally, there is a sense of recognition when he or she is correlated with the product or service. As it pertains to actual fiscal value, a report from the Journal of Advertising Research estimated that, though the effect on stock returns is constant, and in some cases highly significant, the celebrity endorsement effect often has much less of an impact on sales. Buzzworthy yes, but invaluable…not always. 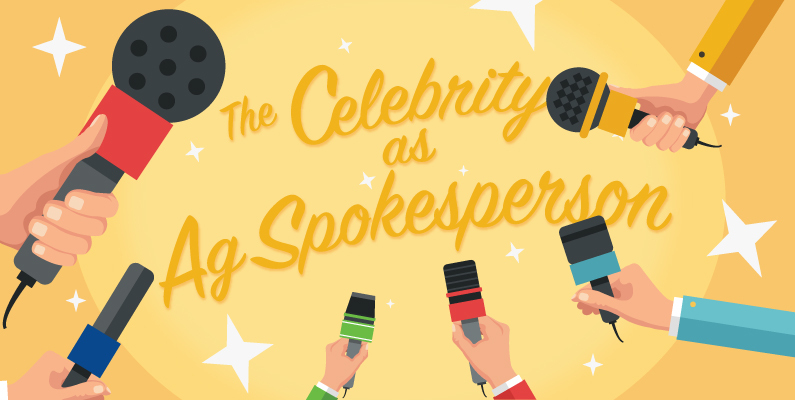 When we consider the celebrities within ag, we tend to find broad ambassadors of the industry as opposed to specific product and brand representatives. Scientist and TV personality Bill Nye (“Bill Nye the Science Guy” and “Bill Nye Saves the World”) is known for his scientific and biotechnological expertise, particularly his understanding of and support for GMOs. He is also an avid participant on the air and in STEM and ag advocacy and education programs. Billionaire and philanthropist Bill Gates is another biotechnology advocate, speaking frequently about the opportunities for its advances and how it has the potential to reduce, among other issues, global hunger problems. Likewise, ag supporter and TV personality Mike Rowe (“Dirty Jobs” and “Somebody’s Gotta Do It”) works closely with the FFA and similar organizations to bring the camera onto farms and through other industries to show how America’s work gets done. Finally, the Food Network’s Ree Drummond (“The Pioneer Woman”) records her weekly show on her family ranch in Pawhuska, Oklahoma, and welcomes visitors to tour its sprawling 433,000 acres. In addition to her other food-related entrepreneurial endeavors, Drummond has branded lines of KitchenAid equipment. As glamorous as life appears for public figures, they aren’t immune from the same errors in judgement and/or the tragedies of life that befall us all. Be it adverse content expressed on social media, behavior that raises one too many eyebrows or actions that cross the line, they suffer the same humanity as the rest of us and occasionally they stumble and fall. Some have gone as far as to publicly take on specific sectors within agriculture, while others have dealt with situations more insular. Whether it’s within the confines of ag or a personal situation, as messy and sometimes tragic as they may be, celebrities have two additional challenges to face: the business of their actions and the court of public opinion. Sometimes the question is who is more forgiving. When brands partner with a celebrated individual, it’s a responsibility on both ends. Brands must carefully observe and evaluate the behavior of the individuals representing them to ensure that the risk is as minimal as possible. And when that risk rises, Business Insider notes, the brand must assess the issues at hand, how much consumers associate the celebrity with the brand, the relative fame (as it were) of the individual in question, and the value of the contract. When push comes to shove, it might be worth paying out a contract to minimize brand damage or, at the very least, have a solid crisis plan in the pocket. But a brand must ask itself, is there anyone worth that risk? A famous face can bring positive attention and awareness, but it should always be carefully vetted and monitored to protect a brand and its assets.